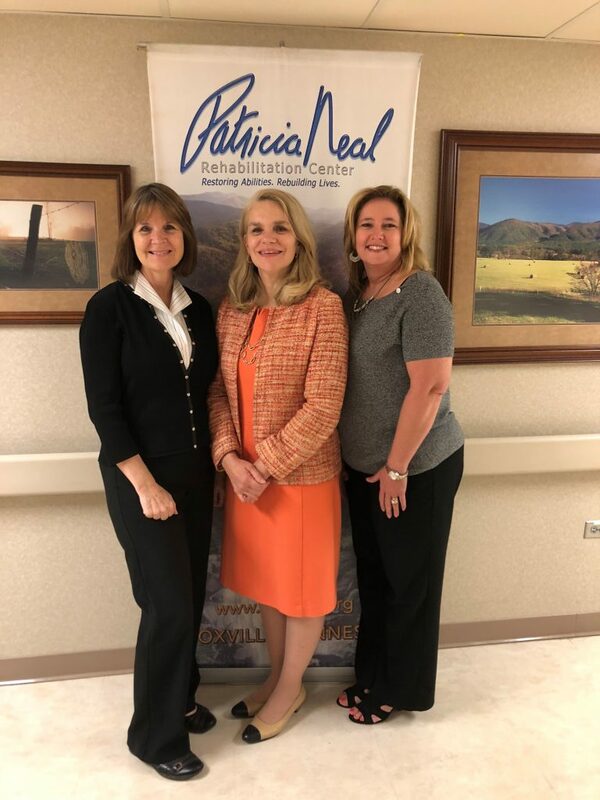 Pictured from left: Leslie Irwin, vice president and administrator; Mary Dillon, MD, medical director; Jennifer Steely, director of clinical services. Fresh out of physical therapy school in 1978, Leslie Irwin decided to apply for a job in Knoxville. Her interview included a tour of the brand new rehabilitation facility being built within the walls of a hospital. Now administrator of Patricia Neal Rehabilitation Center at Fort Sanders Regional Medical Center, Irwin looks back 40 years to the beginning of what was to become one of the most comprehensive rehab facilities in the region, recognized nationally for excellence in clinical outcomes and the highest levels of patient satisfaction. PNRC was primarily developed to give local stroke patients a place to recover at a time when they were being transferred to other states for rehabilitation. No one knew at the time that patients would eventually come to the center from other areas of the state, across the nation and around the world. But Patricia Neal Rehabilitation Center also stands strong in 2018 because some things never change. But Patricia Neal Rehabilitation Center also stands strong in 2018 because some things never change. The best interests of the patient and the patient’s family still come first. And the center relies on the continued commitment of therapists, nurses, and medical staff, Fort Sanders and Covenant Health leaders, the Fort Sanders Foundation, donors and valued corporate partners. Jennifer Steely, director of clinical services, joined PNRC in 1995. Steely says many of the center’s employees have been on staff for 20 years or more. “It may be uncommon in the general work force of the world, but it’s not uncommon here,” Steely says. PNRC offers a hospital level of care. “The patients we have this afternoon were in an acute care hospital this morning,” Irwin says. The physicians are board certified physical medicine and rehabilitation specialists. They lead the rest of the team that helps patients become more independent. That means tasks as simple as being able to brush their own teeth or as complicated driving a car. Mary Dillon, MD, has been medical director of PNRC since 2003. She and other physician specialists (doctors who specialize in rehabilitation are known as physiatrists) provide medical care for patients, and she refers to the rehabilitation physicians and staff as a team of people who have “a calling” for what they do. At Patricia Neal Rehabilitation Center, the goal is to restore patients’ quality of life, sometimes after the patients themselves weren’t certain they could even survive. Irwin says it was exciting to treat the very first patients in 1978, but being at PNRC in 2018 is even better. To learn more about Patricia Neal Rehabilitation Center, its programs and its history, visit www.patneal.org.